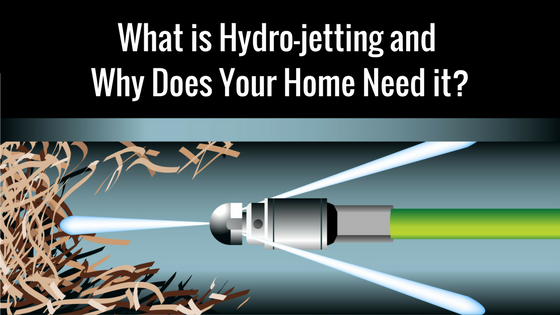 What is Hydro-Jetting and Why Does Your Home Need It? If you have clogged pipes, you may have run out of ideas on how to resolve the problem. When a plunger or snake doesn’t work, what’s the next option to try? Hydro-jetting may be just the solution. Let us explain what this method is and how it can help you get past the toughest of clogs. With hydro-jetting, a high-pressure hose with a special nozzle is connected to a water-pressurizing machine. This creates a powerful stream that can clean out the drain without damaging the plumbing structure. The Plumbers at Green’s Plumbing will check out your pipes to determine if there is any pipe damage and to see if hydro-jetting is a good option. If it is a good solution, we will then move forward. In most cases, hydro-jetting is done through the clean-out (an opening that allows plumbers to reach clogs). The water is forced down the drain–pushing grease, mineral build-up, hair clogs and anything else that is clogging your pipes straight through the plumbing. Why Does Your Home Need Hydro-Jetting? Hydro-jetting cleans the entire diameter of the pipe which breaks up the clog and improves your flow to avoid future clogs. This method of clearing pipes can even break some roots throughout your plumbing. Compared with other forms of cleaning, hydro-jetting is environmentally safe. Hydro-jetting doesn’t require the use of chemicals. Hydro-jetting cleans AND clears pipes–leaving them nearly as good as new. Hydro-jetting is an effective and affordable method of clearing clogs for many households. If you would like more information about Hydro-Jetting or to schedule a free, no-obligation estimate, contact us at Green’s Plumbing today. We look forward to working with you.